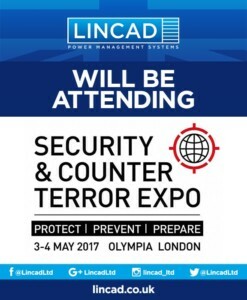 Lincad, the industry-leading designer and manufacturer of bespoke batteries, chargers and power management systems for military and other specialist applications, will be attending Security and Counter Terror Expo 2017(SCTX). Taking place on the 3rd and 4th May at Olympia London, and supported by the Home Office, the event is the UK’s leading national showcase for the capabilities, strategies and intelligence required to keep nations, infrastructure, business and people safe. It brings together more than 10,000 senior professionals from Government, the military and security services, law enforcement agencies, border security, transport security and major events security, the emergency services, those responsible for critical national infrastructure and a wide range of private sector organisations. With over 30 years of experience, Lincad continues to take product performance to new limits, producing lighter, more powerful batteries with faster, more flexible charging solutions. With its main customers comprising of the UK Ministry of Defence, UK Defence Primes and Strategic Military and Defence Partners, attending SCTX enables the company to grow its reputation and expertise in assisting the police and security forces experts in protecting our nation against the threat of terrorism, as well as meet potential new customers and business partners. Since 2012, Lincad has been providing the British Armed Forces with lithium-ion rechargeable batteries to power CUTLASS, the remotely operated vehicle used for explosive ordnance disposal.